Firstly I want to say happy new year! I hope it brings you everything you could wish for. 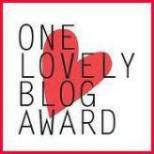 1) Add the “One Lovely Blog Award” image to your post. 2) Share seven things about you. 3) Pass the award on to seven nominees. 4) Thank the person who nominated you. 5) Inform the nominees by posting on their blogs. 1) I own 3 replica Star Wars Lightsabers and 2 Harry Potter wands. 2) I have a gorgeous cat called Merlin and a puppy called Cookie. 3) I have always wanted to be a writer. 4) I used to be in a band called Frozen Passion. 5) I have finally made it to university after 4 turbulent years. 6) I feel like I am finally where I belong. 7) I have a wonderful Ford Fiesta named Stanley. My second nominee is actually another good friend of mine. Her blog is called Like a Sloth and its very witty and full of life. It does focus on a bigger picture which involves her suffering with various illnesses but it is a great read and totally deserves an award. If not for her just being brave enough to be constantly stabbed with needles by scary doctors. So well done Char and keep writing! My next nominee is a blog that I fell across by accident. It’s called Stuff Kids Write and it is absolutely brilliant. It is a wonderful insight into the minds of kids everywhere and the stuff that they write at school or at home. So seriously check it out because it’s a great laugh. Congrats! My fourth nominee is a blog called The Top 10 of Anything and Everything. It’s a wonderful blog that does what it says on the tin really. It’s a fascinating corner of the the blogging world that is just full of random things and I love it. The next nominee is another good friend of mine who is also an avid writer. Like me Charlotte Fawdry writes poetry. She writes confidently and her poems conjure all sorts of images with her descriptive techniques. I can’t wait to see what she’ll share with us next, keep up the good work! The sixth nominee is Revise Sociology. I know that this seems completely random but this bog was invaluable to me when I was studying for my A-levels last June. It tells you all that you need to know and really is a great starting point for revision. Thank you so much for the time and effort you have put into this blog!! And finally the last nominee is A Passionate Wanderer. This blog has been an inspiration to my writing so many times. Thank you for continuing to share your writing with us and don’t ever stop! This award is fully deserved, well done!